The Lions Children’s Christmas Telethon is an annual event that is produced and streamed live from Canadore College’s in-house TV studios. Every year, first and second year Broadcasting: TV & Video Production students have a great opportunity to get incredible hands-on experience with the telethon, and also get a chance to give back to the community in a great way. The Lions Children’s Christmas Telethon raises money for the less fortunate in our community and helps families in need have a much happier and bountiful holiday season. This year, I had the opportunity to be one of the producers for the telethon, meaning we were in charge of organizing the performing talent, and structuring the way the show would be presented to the viewers. Five weeks of planning and producing allowed for a very successful show to air this past Saturday, November 25th, raising over $22,000 for those in need. From the student’s perspective, the telethon is a moment of excitement and a chance to be exposed to real-life experience in our field of study. 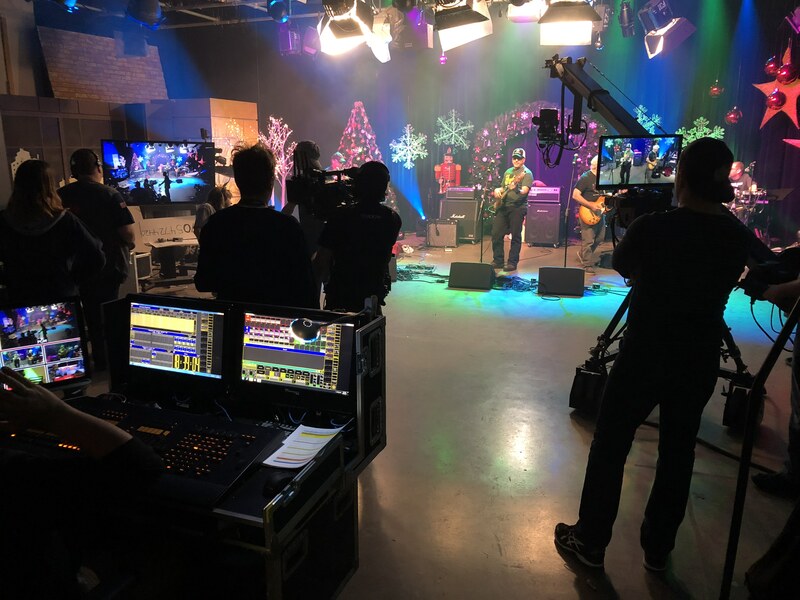 From decorating each TV Studio with Christmas trees, ribbons, wreaths and lights, to checking mic levels and the technical side of things, it really is an incredible experience for all involved. Being a producer this year, I found myself (naturally) taking on a lot more responsibilities then I did the previous year. I, alongside Keesha Cheechoo and Daria Fesenko produced the show from beginning to end, and had to assign crew positions, organize the lineup, and troubleshoot any situation that came our way. However, dealing with last-minute cancellations, technical difficulties, and making sure we finished the show on time was absolutely worth every minute of stress and sweat (and maybe even a little bit of swearing) because of the outcome. The 2017 Telethon taught me that my education is paying off and my career path is on the right track. I found myself enthused by the high-pressure situations, and riding the wave of adrenaline that comes along with live broadcasts. All in all, raising money for the less fortunate in our community was the highlight of this year’s Lions Children’s Christmas telethon because it allowed so many people to give back to those that truly deserve a happy holiday.